It was one of those happy/sad episodes for me on Big Break Disney this week. First I was really happy that Kevin Erdman escaped his second elimination challenge (Although I think he’s trying to give me a heart attack! ), but I was sad to see Kevan Maxwell, better known as KMAX, leave this week’s show. But as sad as it was to watch him leave so early, something tells me that KMAX will “be back” as Arnie would say. You can’t put a golfer down with that much confidence and passion. So Kevan, I wish you all the best! Meanwhile, we had a jam packed show tonight with lots of great challenges and tension filled drama between Andrew and Blake. And who was in the middle of that drama, but our friend Vincent. How fun was that Vincent? Ah…now it makes more sense. Producers are tricky devils, aren’t they? Mike Perez joined me this week and shared his thoughts on the challenges, the drama and the “not so special” guest, PGA tour pro, J.B. Holmes. Gotta love Mike – always has honest, shoot from the hip comments. Haha…Thanks Mike! Tony will join me Wed night for his interview this week. So come back to hear what he had to say about this week’s excitement. At Ka’anapali they did have one eliminated contestant who appeared in a 3-way confessional. It might have been Samantha Head. But that was a case of a very popular contestant being consoled, a spur of the moment type thing when the other women jumped into the confessional. 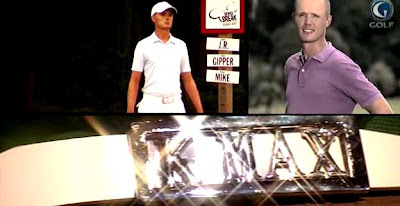 Jackass Golf Channel has pulled those Ka’anapali confessionals from its website so I can’t go back and check. Last night it didn’t fit that mold, plus guys aren’t exactly consoling types in a situation like this, so I concluded Kevin Erdman was safe. This is a great blog! Check mine out! Awsi, you have an amazing memory! I wonder if the Samantha interview was mentioned in any of my BB Ka’anapali interviews. I’ll have to go check. Happy SITS day! I’m sorry I don’t know much about golf. But I loved the pictures. I think this is a great blogging niche! I thought Kevin and Sean were smart to go for the lay-up. You play differently when the goal is “don’t be last” rather than “be first.” You just make sure you get to the next show. Do you think the other contestants might have wanted these guys to hear the comments? If I thought I might end up against a smart player in a later elimination challenge, I’d certainly want him to second-guess himself rather than make the right shot! Hey Mike. I agree – they were trying not to lose and that’s a different play. You make a good point. There may be some mind games going on with the other guys. Of course the producers got the bench going by telling them the shot was easy, but I wonder if they would have said that stuff anyway. I found your blog. Love it! I was hoping that KMAX would stay in it because he seemed to be the least accomplished and he deivers pizza to live his dream. I think that tall brother will end up winning it. He was on Golf Fix a few months ago and that guy can really kill it.